BACA held another of its increasingly popular training sessions for members yesterday, focusing on best practice. 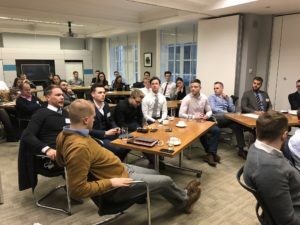 In such a fast-moving and evolving industry BACA strives to ensure that brokers have the opportunity to keep up-to-date with the latest market trends and regulations, and to get together to share ideas and feedback. This set of training sessions was no exception, it was a case of standing-room only. In attendance were representatives of twelve major international broking companies as well as aircraft operators, service companies and handlers. The event kicked off with a session by Gogo Business Aviation and a presentation from Jim Zanino on inflight connectivity. He was able to demonstrate how their sophisticated platforms operate to keep clients connected onboard and how far that technology has advanced. The mainstay of the day was BACA’s own guide to best practice, delivered by Julie Black of Hunt & Palmer and Kevin Ducksbury of Emerge Aviation. Focussing on “the role of the broker”, many aspects of arranging a charter flight were covered in detail, including: defining the broker relationship, prequalification, types of and reasons for charter; plus key operational aspects such as the Freedoms of the Air, airport choice, permits, crew duty, safety checks, pricing pitfalls and liability. Following these comprehensive morning sessions delegates enjoyed a networking lunch before returning for the afternoon session, which delved deeper into the role of the broker. Synergy Aviation’s Richard Nolan gave a concise presentation, detailing the charter process from the operator’s perspective, with tips on their expectations of the broking relationship. The session included operational procedures and resources alongside the importance of account management, client retention and business development. BACA Chairman Richard Mumford concluded the day by saying that the informative presentations had clearly demonstrated the complexity of the charter process and the value that the broker brings to that relationship, for both client and operator alike. He went on to thank the presenters for a very successful day’s training and the attendees for their enthusiastic engagement.